Mr. Olumide Akintayo, immediate past president pharmaceutical Society of Nigeria (PSN), (left); Ahmed Ibrahim Yakasai,PSN President; Dr. Okezie Victor Ikpeazu, Governor Abia State, during a courtesy call to the Governor in Government House Umuahia for the 90th annual national conference of the society, ‘Abia 2017’ on Monday. Pharmacists under the auspices of Pharmaceutical Society of Nigeria (PSN) have stressed the need for the country to achieve self-sufficiency in pharmaceutical production. They noted that this will remove Nigeria from the list of countries that have become dump sites for fake drugs. Speaking for pharmacists was Ahmed Yakasai, President of PSN who spoke at the society’s 90th annual week-long national conference in Umuahia, Abia state which started Monday. 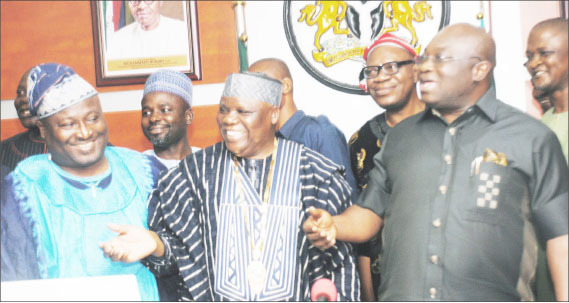 Yakasai said that PSN is at the vanguard of ensuring that the country emerge self-sufficiency in medicine production so as to contribute to the nation’s Gross Domestic Product (GDP). He said; “In a bid to continually contribute to National Development we have adopted the choice theme “Medicines Availability and National Security”. Yakasai argued that a nation that does not strive towards self-sufficiency in medicine production risks vulnerability to “perishing at the altar of its enemies who just need to lace some of its fast selling lines with poisons to inflict substantial mortality. According to him, the passion to achieve self-sufficiency in medicine production also informed the choice of Dr. Andrew S. Nevin, PhD, Partner-FS Advisory Leader and Chief Economist and Global Leader – Project Blue, PwC, Nigeria as the Keynote speaker at the conference opening ceremony. Dr. Nevin is one of the leading PwC’s global thinkers, working at the complex intersection of economics, strategy and regulation with over 30 years professional experience, Yakasai said. The PSN President also pledged that the society will properly position the over 150 pharma manufacturers of various sizes for the target of increasing the size of the pharmaceutical market which is presently worth meagre $1.3 billion dollars, accounting for less than 0.25 per cent of National GDP. Already, four of them have World Health Organisation(WHO) prequalification. He also said that PSN has contributed its quota to the advancement of the healthcare profession in particular and the well-being and happiness of Nigerians in general in the last one year. The PSN boss gave a breakdown of some of the society’s activities which includes: symposium on inter-professionalism among the health care providers; launching of PSN Foundation; construction and unveiling of PSN Monument at National Institute for Pharmaceutical Research and Development (NIPRD) headquarters; establishment and commissioning of PSN Medicine Information Centre, among others. He also said that PSN will continue to champion mentorship programmes for colleagues, particularly the young ones. Earlier, Yakasai identified delayed and unlawful appointments in regulatory agencies, poor composition structures in the health sector, including lopsided appointments in Federal Health Institutions and poor attitude to research and development as challenges facing the health sector. Yakasai who said this while answering questions from journalists, also said bemoaned poor infrastructure, remuneration package among other things as part of the problems plaguing the sector. About 5,000 pharmacists and scientists from Nigeria and the Diaspora are attending the week-long largest annual gathering of pharmacy professionals which started Monday. Yakasai assured that the conference would address the imperatives of medicine availability to national security. “In this light, the Pharmaceutical Society of Nigeria has been a strong advocate for local manufacturing of pharmaceuticals and the need for government to create friendly environment for pharmaceutical sector in Nigeria,” he said. As part of the conference, the leadership of the society weekend embarked on medical outreach at Ubakala Autonomous community in the state. The outreach with seven doctors, 20 nurses and 40 pharmacists included screening, consultation, counseling and drug dispensing.